A year or so ago I was reading yet another one of those How To Be More ________ articles that never seem to go out of style. You simply fill in the blank and are instantly on your way to helping millions of us poor slobs turn into better, more proficient people. How To Be More Organized. . . More Beautiful. . . More Wealthy. . . More Politically Correct. While I've failed miserably over the years at becoming more organized and clutter-free, I did latch on to a small but significant concept from this particular article, whose subject was something along the lines of How To Be More Happy And Content With Your Life. After reading it, I stopped saying "I wish." I wish I hadn't overcooked the broccoli will not improve the state of what is sitting on your plate. I wish it wasn't so hot and humid here will not change the weather. I wish I had a million dollars will never make it magically appear. I wish you weren't so far away will not bring them any closer. I wish he hadn't died is never ever going to bring him back. On the surface, simply not saying I wish. . . doesn't seem to make much sense. I mean, of course you wish all those things were true. But I have come to realize that saying them out loud is actually a waste of time and energy, as wishing for something (rather than actually doing something) only brings about feelings of dissatisfaction and unhappiness. After reading that article, I became aware of was just how often I found myself saying I wish, and I was surprised by the frequency. I made a conscious effort to stop saying it. It was an easier habit to break than I thought it would be, although there are still times when a wish is on the tip of my tongue, and it is all I can do to stop it from escaping. Not wishing for things to be any other way than how they are has definitely had a positive effect on my life. There is, however, one thing I cannot help still wishing for--that our wet weather creek would run all the time. There is something so profoundly soothing about the sight and sound of that crystal clear water ambling over the rocks. It is an immediate stress reliever. This morning was crisp and bright, blue sky and a pleasant 38 degrees. I stood in the front field with the sheep and deeply breathed in the day, while listening to nothing but the high-pitched cry of a hawk overhead, the rhythmic munching of my flock, and the babbling of the creek as it meandered its way along the edge of the field. It's rare for the creek to be flowing on a hot summer day, but once in a while it is. That is when we finish our chores up early, slip into flip-flops (which are totally unsuitable farm footwear except for this one instance), grab a couple of ratty towels, and make our way down to one of the two little swimming holes in front of the house that were conveniently formed a few years back during a flood. With the sun still beating down on you with all of its might, just looking into that cool water and anticipating how it will feel on your hot, sweaty skin is almost refreshing enough. At this moment, all of the world's problems have been reduced to one pressing question: Should you take it one toe at a time, or go ahead and splash right in? Merrily, merrily, merrily, merrily, life is but a stream. I am so enjoying your blog; your pictures and narrative really do take us there. I look forward to many more journeys. I *wish* I could join you for a dip at the swimming hole! Actually, most of my wishes are about other people...I wish they weren't so rude, I wish people could live as though colour didn't matter etc., but I guess sometimes even that kind of wishing is a waste of energy. It's how we personally live and how we treat others that counts. Sorry...didn't mean to get all philosophical! Beautiful post. Reminded me of a quote from a Barbara Kingsolver essay, "In my darkest times I have to walk, sometimes alone, in some green place.... for me it's the need to stare at moving water until my mind comes to rest on nothing at all. Then I can go home." Water is definitely a soothing force! Really a lovely photo of the creek, and a thought provoking post. great photo and nicely written words of wisdom. Well said - made me smile! There's two kinds of wishes -- those for the impossible, which are indeed a waste of time and emotion, and those for the possible, which aren't. 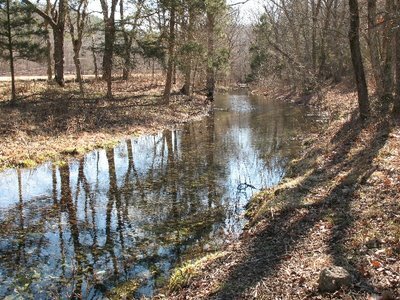 Perhaps if you wish creatively enough for a year-round creek you'll figure out how to do it. After all, it's creative wishing that moving your dream of a bakery along. Hmmm...about wishing, which I wrote about just today on my blog. I don't think wishing is a bad idea at all. It won't do for me to wish to be ten years younger or five inches taller; pointless. But I can wish to be living in a different way. And that kind of wishing may lead to change. After all, didn't you wish your life on the farm before you actually chose it? Fascinating thoughts about wishes. I keep thinking of the old saying -- if wishes were horses, then beggars might ride. What a lovely picture -- and stream of thought. I like to think of some of my wishes as little prayers that may or may not be answered in a way that I am able to identify. Of course silly wishes are just that...silly. Like, I won't be able to fly under my own physical strength any time soon. What a great post. There is so much truth in that. You are a wise woman as you can recognise the beauty in the little things and not in the things that you do't yet have or want. A big farm hug to my all time fave blogger. Thanks for visiting my blog! I really do love your photos.